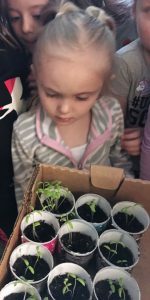 Hilltop Elementary Cafeteria Manager Johnnie Wayt and cook Missy Francis collaborated on a project to give students at the school their own homegrown tomato plant. The two began by collecting and washing empty plastic chocolate milk containers. 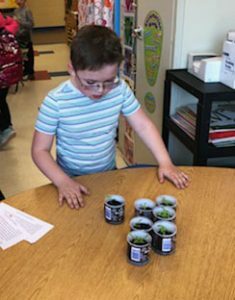 Each of the 430 bottles were cut in half and a tomato seed was planted in soil. 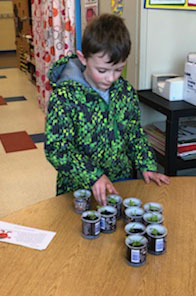 The cartons were placed on display in the school’s cafeteria so students could watch the plants grow. 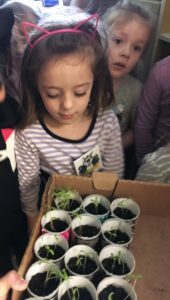 When the time was right, a tomato plant was given to each student to take home to share “the fruits of their labors” with their family members. Wayt and Francis have been overwhelmed with the responses from the students: cards, hugs and kind words.